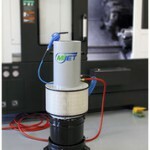 The MiJET Parts Cleaner has revolutionized the way parts are cleaned in shops and manufacturing units. There are numerous benefits of using the MiJET. It not only helps you clean machine parts effortlessly but also keeps the shop floor cleaner at the same time. Along with that, it makes your shop greener by recycling materials as well as saves you time and money on production runs. Swift Operation: It’s simple to operate and clean. Also, it is easy to turn on/off using the air supply trigger or air pedal (available with blind-hole unit). Requires No Electricity: The MiJET is powered by compressed air and uses a single airline available in your shop. So, it can be used wherever an air supply is available. Also, it is easy to connect and disconnect from the air supply. The MiJET can be used in damp environments as well, as there is no risk of electrical shocks. Compact and Portable Design: It takes up very little space in your shop and can be located right next to the production equipment. And its optional roll around dolly allows it to be positioned wherever parts cleaning is required. Recycles Lubricants & Scraps: All the debris from the parts being cleaned is captured in the recycling container. This way you can reuse the expensive coolants and solvents. Also, the scraps, chips, and debris from parts can be recovered and recycled. Along with the above mentioned benefits, traits such as several configuration options, cost effectiveness, OSHA and NIOSH compliance, small footprint, etc., make the MiJET parts cleaning system a must have for every shop involving parts cleaning! This entry was posted in advanced parts cleaning system and tagged MiJET parts cleaning system. Bookmark the permalink.